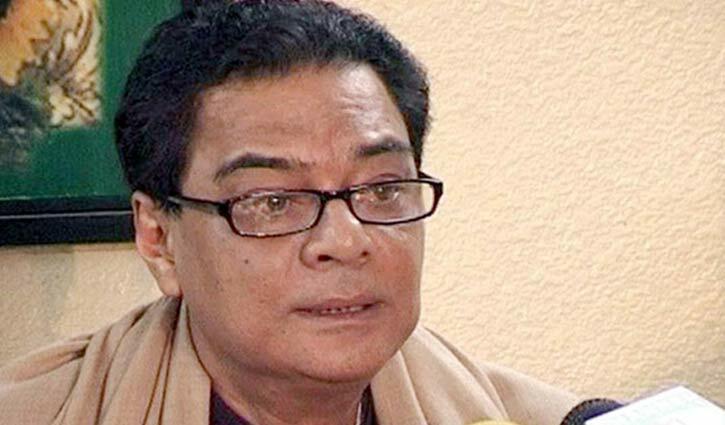 Desk Report: Awami League Presidium member and Public Administration Minister Syed Ashraful Islam, who passed away at a Thailand hospital on Thursday, was laid to eternal rest here on Sunday. He was buried at the Banani Graveyard after Asr prayers following three namaz-e-janazas – first at the South Plaza of the Jatiya Sangsad, second one in Kishoreganj and the third one Mymensingh. President Abdul Hamid, Deputy Speaker Md Fazle Rabbi Miah, Chief Whip ASM Firoz, ministers, leaders of Awami League and other political parties, noted personalities and people from all walks of life joined the first janaza held at the South Plaza of the Jaitya Sangsad at 10:34 am. President Abdul Hamid, Prime Minister Sheikh Hasina, Speaker Dr Shirin Sharmin Chaudhury paid tributes to the Awami League leader by placing wreaths at his coffin after the janaza. On behalf of Awami League, its president Sheikh Hasina, flanked by party senior leaders, placed another wreath at his coffin. A team of 14-party alliance, led by Mohammad Nasim, also placed a wreath at his coffin as a mark of respect to Syed Ashraf, son of national leader Syed Nazrul Islam who had served as the acting President of the Mujibnagar government in the absence of Father of the Nation Bangabandhu Sheikh Mujibur Rahman during the War of Liberation in 1971. The body of the veteran Awami League was taken to the Parliament complex from the Combined Military Hospital (CMH) at 9:30 am. His colleagues, supporters and well-wishers in their thousands converged on the Parliament complex to pray for his departed soul. Syed Ashraf, also a freedom fighter, was given a ‘guard of honour’ while bugle played the last post. Later, Ashraf’s body was taken to his home district Kishoreganj by a helicopter where his second janaza was held at Sholakia Eidgah at noon. Thousands of people took part at his second namaz-e-janaza there. Then his body was taken to Mymensingh where another janaza was held at Anjuman Eidgah at 2:54pm. The body was flown back to the capital from Mymensingh and the Awami League leader was laid to eternal rest at Banani Graveyard after Asr prayers. Syed Ashraf died of lung cancer at Bumrungrad International Hospital in Bangkok around 9:45 pm on Thursday at the age of 67. The body of Syed Ashraf was brought back home on Saturday evening. Syed Ashraf was elected MP from Kishoreganj-1 constituency five times – 1996, 2001, 2008, 2014 and 2018. In Sunday’s election, the AL leader came out successful from the parliamentary seat. He, however, could not take oath on Thursday when all the Awami League MPs were sworn in. The AL leader submitted a letter to the Speaker on the day seeking time for taking the oath. In 2008, Syed Ashraf returned home from London to steer Awami League during the army-backed government when the party went through a difficult time. He was made the party’s general secretary in 2009 and served for two consecutive terms till 2016.